This is being submitted to this week’s Weekend Herb Blogging, hosted by Chris from Mele Cotte. 1. Preheat a large, heavy bottomed pan over medium heat (cast iron is preferred.) Saute the onions in olive oil and a pinch of salt until translucent, about 3 minutes. Add garlic and saute about 30 seconds more. Season with black pepper and salt. Add asparagus and toss to coat. Cook for about 2 minutes, then add nectarine, and cook for about 2-3 more minutes. The asparagus should be a bright Kermit green, and the nectarine should release some of its juices. 2. Add beans and toss to coat. Cook until they are warmed through, about 2 more minutes. Taste for salt. Turn off heat and let sit for 5 minutes or so, so that the flavors can meld. 3. In the meantime, prepare red lettuce leaves. Just peel off the good big ones, rinse and dry them. 4. 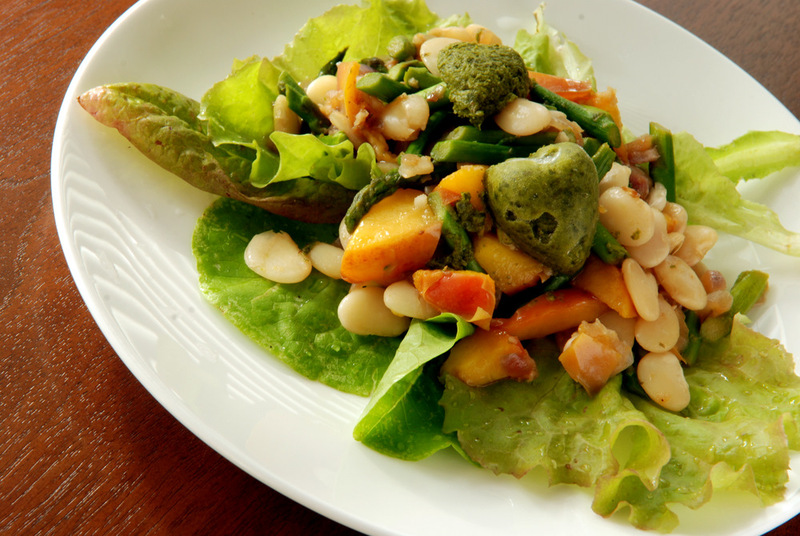 To assemble wraps, place a few leaves on each plate, spoon in some beans and plop on a nice big scoop of the pesto. Such a pretty green! I love fruit in my salad – peaches especially. They are incredible grilled too! I always feel like nectarines are a bit firmer and taste a bit tarter…but maybe that’s just me. I also love them more than peaches, at least for snacking on! And I’m sure I would love these lettuce wraps. Including fruit in my main course is something I should do more often. I love this! 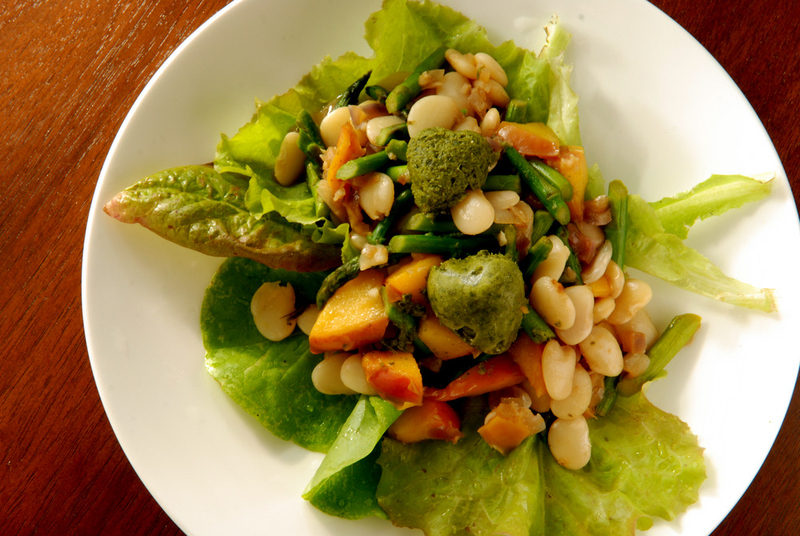 Adding the grilled nectarines in a salad is a brilliant idea. Grilled stone fruit adds such a depth of flavor to whatever its paired it. Thanks for participating in WHB! The heart shaped pesto is indeed very cute! I think it was the first thing I noticed in the photo haha. These look like they could get messy eaten as a lettuce wrap, but extremely delicious!